Old Betsy McCall Paperdoll Page From the McCalls magazine here's an uncut Betsy McCall paperdoll. This is "Betsy McCall Tries 5 New Hairdos" from June 1971. This page is in very good condition. I have many of these pages listed. If you buy more than one there will be no extra postage charges on the other pages if all sent in one order. Just request a total from seller invoice upon buying. Winning bid pays 2.75 p/h. More outside US. Thanks for looking. MARY ENGELBREIT Home Companion Magazine Paper Doll This is a Mary Engelbreit Home Companion Magazine uncut paper doll of Georgia from the April/May issue, 2006. It measures 8" x 6 1/2" and is in very good condition. (Love the artwork!) 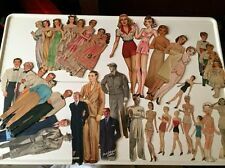 I will have many of these Mary Engelbreit Home Companion magazine paper dolls for sale and just like my Betsy McCall paper doll pages I will charge postage on the first one but if you order more than one the others will be postage free if sent in the same order. Just place your purchases in the shopping cart and then hit the link "request total from seller" and I will send you an adjusted invoice. Winning bid pays 2.50 p/h. More for orders outside the U.S. THANKS FOR LOOKING. 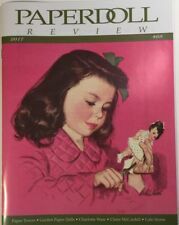 MARY ENGELBREIT Paper Doll, Gracie, June/July 2005, Uncut Home Companion Mag. (Includes: 1) February 1961: Betsy McCall Goes to the Westminster Dog Show. 2) May 1961: Betsy McCall and Linda Go to The Circus. This one features her cousin Sandy. Full color and uncut. Sheets have darkened with age. Jack and Jill Magazine Paper Doll This is an uncut vintage paper doll done by the artist Georgeann Helms for the Sept. 1959 Jack and Jill magazine. This one is part of the Linda Goes West series and is of her sister JUDY joining her on the Ranch. It is in very good condition. Winning bid pays 1.95 p/h. More outside the US. I will combine wins to save you on postage. Thanks for looking. They were published in "Teddy Bear and Friends" magazine in 1990. This is an uncut set with lots of cute clothes. The Lady of Sudan Goes to Paris Paper Doll This is a paper doll called The Lady of Sudan Goes to Paris by the artist Peggy Jo Rosamond. It's of an antique black doll and her Parisian clothes. It is from 1988, from one of the Doll magazines. It is in very good condition with just a little yellowing on top edge. Winning bid pays 1.95 p/h. More outside the US. I will combine wins to save you on postage. To take advantage of combined postage you need to use the shopping cart and then request total from seller link. Thanks for looking. From the McCalls magazine here's an uncut Betsy McCall paperdoll. This page is in very good condition. 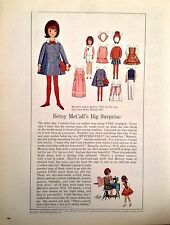 Old Betsy McCall Paperdoll Page. We include a full page paper doll of Lydia Fraser's "Sue and Babs Attend a June Wedding" from 1937. Lilibet Paper Doll This is a paper doll of a little doll called Lilibet a British Princess done by the artist Peggy Jo Rosamond. They are two 9" x 12" color pages from the 1985 Doll Reader magazines. It is in very good condition with a little corner wear. Winning bid pays 1.95 p/h. More outside the US. I will combine wins to save you on postage. To take advantage of combined postage you need to use the shopping cart and then request total from seller link. Thanks for looking. Dorothy, 1930’s Doll Paper Doll This is a paper doll drawn by artist Susan Hoffman for a 1985 doll Magazine. It is in very good condition with just a corner off. Winning bid pays 1.95 p/h. More outside the US. I will combine wins to save you on postage. To take advantage of combined postage you need to use the shopping cart and then request total from seller link. Thanks for looking. The Roaring Twenties Paper Dolls This is a paper doll from the National Doll World magazine of May/June1987. It was done by Loraine Morris who did a lot of paper dolls for the National Doll World. 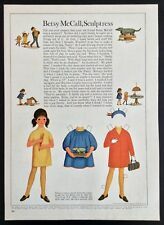 This 2 page uncut color paper doll is in very good condition. Winning bid pays 1.95 p/h. More outside the US. I will combine wins to save you on postage. To take advantage of combined postage you need to use the shopping cart and then request total from seller link. Thanks for looking. Jack and Jill Magazine Paper Doll This is an uncut vintage paper doll for the Sept 1953 Jack and Jill magazine. It is the Pilot & is the Stewardess of the Journey Friends series. It is in good condition. Winning bid pays 2.50 p/h. More outside the US. I will combine wins to save you on postage. Thanks for looking. 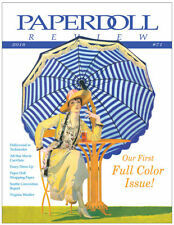 Marilyn Henry talks aboutHollywood Fashions, a rare paper doll book featuring a fantastic 1930s wardrobe. From the McCalls magazine here's an uncut Betsy McCall paperdoll. This is "Betsy's Christmas Adventure" from Dec. 1994. This page is in very good condition. Old Betsy McCall Paperdoll Page. An original and uncut paper doll. Paper doll only.not complete magazine. In very good condition. (Includes: 1) February 1963: Betsy McCall's Trip to New York. 2) March 1963: Betsy, Linda and The Easter Rabbit. 4) September 1963: Betsy McCall Adopts a Kitten. 5) October 1963: Betsy McCall and the UN Fashion Show. (Includes: 1) February 1964: Betsy McCall Writes From the Bahamas. 2) March 1964: Betsy McCall at the Egg Rolling. 3) June 1964: Betsy McCall and The Wedding Gown. 4) July 1964: Betsy McCall Writes From Camp. Edie May: Dressing like Dolly - 2009. This is a paper doll of Kathy as drawn by artist Katherine Zu Arnold in 1993 for the Contemporary Doll Magazine. It is in very good condition. From the McCalls magazine here's an uncut Betsy McCall paperdoll. This is "Betsy Shares a Surprise" from April 1995. This page is in very good condition. 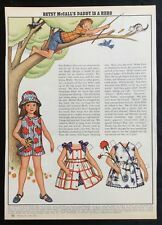 Old Betsy McCall Paperdoll Page. 2 pages form McCalls magazine March and April 1919: 1- The Chic Chicken 2- Easter Greetings Dear Children Both pages have minor ragged edges. Slight age yellowing. From the McCalls magazine here's an uncut Betsy McCall paperdoll. This is "Betsy's First Valentine" from Feb.1995. This page is in very good condition. 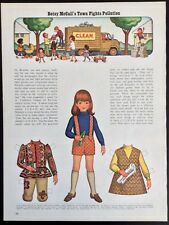 Old Betsy McCall Paperdoll Page. 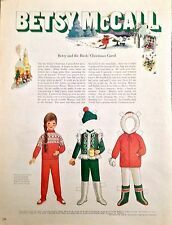 THERES ONE IN EVERY STORY Paper Doll by Pat Frey 1982 National Doll World Mag. This is a paper doll of different fairy tale villainesses as drawn by the artist Pat Frey from the1982 National Doll World Magazine and is in very good condition. There’s One in Every Story Paper Doll. This is a one-page clipping, paper doll in excellent condition. I'm happy to communicate with you.